We were all craving a sweet snack today but I didn't want to cave and buy something processed and unhealthy, so I started searching my trusty resource (Pinterest) for some recipes. 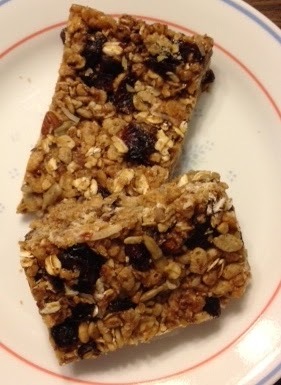 I settled on granola bars but didn't want to turn on the oven, so I was sticking with no bake. I found several recipes and this one was my inspiration for the bars I ended up making. They are so good!!! Little A actually ate 2.5 bars while I was trying to individually wrap them and freeze them for this weeks snacks :) I am thinking I may be making another batch later this week because these are not going to last! One thing to note about these bars, they are not low calorie or low fat but all the fats are healthy from the nuts and nut butter and since you make them yourself you know there aren't any crazy chemicals or preservatives like you find in store bought bars. That and they are so filling and satisfying they pack a punch for the calories. Place honey and nut butter in a sauce pan and heat on medium until thoroughly melted. Add extract to melted mixture and heat until just boiling then remove from heat. Place pan in the freezer for minimum 1 hour (I kept mine in for 3 hours) and cut the bars. Mine made 27 bars (9 rows and 3 columns) but you can cut them into whatever portion size you want. Then individually wrap the bars with plastic wrap, place them in a freezer safe container and into the freezer, and you have the perfect, pre-portioned snack! 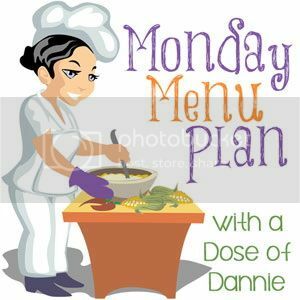 This recipe is being shared on Shrinking Kitchen's Cook and Share board yippee! Do these have to be stored in freezer? Will they be ok left out (wrapped & covered) in pantry? If frozen, how long does it take to thaw before they are ready to eat? I store mine in the freezer because they stay fresher that way. They are usually ready to eat within about 5-10 minutes after I take them out of the freezer. You can also store them in the refrigerator if you want them ready to eat right away. I am not sure about storing them in a pantry as I never have, but I would guess that in an airtight container they would be fine they just wouldn't stay fresh as long. Howdy! This is kind of off topic but I need some advice feom an established blog. Is iit very hzrd to set up your own blog? I'm not very techincal but I can figure things out pretty fast.